It’s time for celebration! In Delphinus, we have a brand new 100% natural habitat in Playa Mujeres for you to enjoy a swim with dolphins like never before! Keep reading and discover more about it! 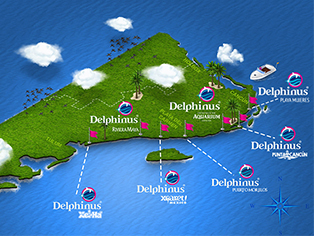 Delphinus Playa Mujeres is our new habitat and is located within the luxurious Dreams Playa Mujeres Golf & Spa Resort. Playa Mujeres is a small town part of Isla Mujeres and is considered as the New Cancun. This place is only 20 minutes away from downtown Cancun and 35 minutes away from the International Cancun Airport. Playa Mujeres is known for its beautiful white beaches and now, it has the biggest habitat for swim with dolphins in Cancun. Besides, it’s the only place in the area where you can do this activity. By now, you are probably picturing yourself in Playa Mujeres, aren’t you? Here you have a list of the types of swim with dolphins that you will find in this place. Choose yours! Dolphin Ride: you have 45 minutes to do 11 different activities with the dolphins, including hugging and kissing them. This activity is for maximum 10 persons. Couples: for 45 minutes, you will be able to dance, hug and play with these stunning mammals. It’s a very romantic and unique experience to have with your significant other. The One: learn these mammals with plenty of time and do more than 20 activities with them, including kissing, hugging, riding them and a foot push! Splash: when you’re going with your friends or family, and you don’t have a lot of time, a 30-minutes experience is perfect for you! You should try it! Primax 4: If you are looking for something just for you and three people more, Primax 4 is de ideal swim for you. You can hug, dance and do a lot of things with the dolphins! What are you waiting for? Discover this amazing habitat in Playa Mujeres and enjoy this awesome experience in your next vacations!